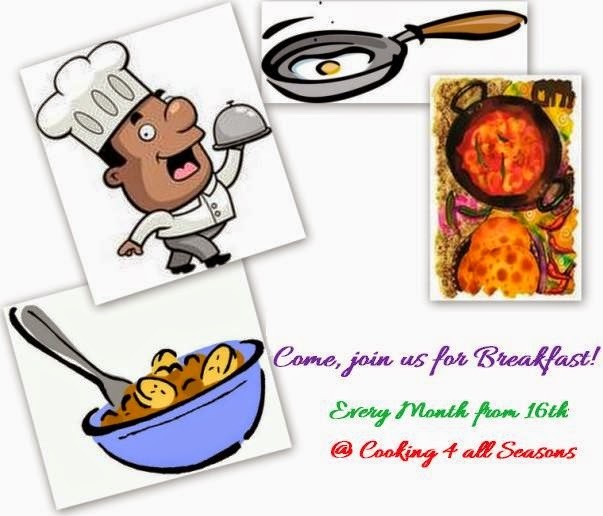 Cooking 4 all Seasons: Come, join us for Breakfast ~ Event Announcement! "Come, join us for Breakfast" this April with your interesting Breakfast ideas! Breakfast is the most important meal of the day. With your ideas, you can help many, plan their breakfast better! That's why my Breakfast dishes run a mile. I have readers asking for more ideas all the time. This event will be about any breakfast, any country. Maybe some editions later, we can get more specific. So, for now, you can send across any breakfast dish you share on your blog. This month also makes it special as it's the blog's Anniversary month. The first anniversary was celebrated with Dosa Mela. For now I have kept it open till I create a new list..so cook any breakfast dish and link them in the linky tool! • Both Veg and Non-Veg are are accepted.